We’d love your help. 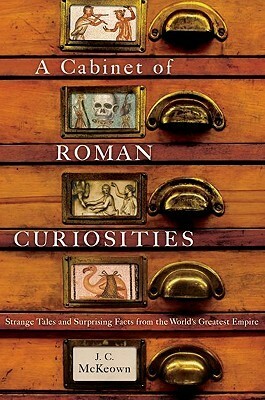 Let us know what’s wrong with this preview of A Cabinet of Roman Curiosities by J.C. McKeown. Here is a whimsical and captivating collection of odd facts, strange beliefs, outlandish opinions, and other highly amusing trivia of the ancient Romans. We tend to think of the Romans as a pragmatic people with a ruthlessly efficient army, an exemplary legal system, and a precise and elegant language. A Cabinet of Roman Curiosities shows that the Romans were equally capab Here is a whimsical and captivating collection of odd facts, strange beliefs, outlandish opinions, and other highly amusing trivia of the ancient Romans. We tend to think of the Romans as a pragmatic people with a ruthlessly efficient army, an exemplary legal system, and a precise and elegant language. A Cabinet of Roman Curiosities shows that the Romans were equally capable of bizarre superstitions, logic-defying customs, and often hilariously derisive views of their fellow Romans and non-Romans. To ask other readers questions about A Cabinet of Roman Curiosities, please sign up. “Touching the nostrils of a she-mule with one's lips is said to stop sneezing and hiccups” (Pliny Natural History 28.57). If that isn't enough to pique your interest in this very entertaining book, then just consider the sorts of interesting things you might learn! Because this book is filled with stuff like I've given above, and the author has provided below. I highly recommend this book, and plan to seek out his other book about the Greeks. Disclosure: This book was a gift from a friend. All opinions are my own. Synopsis: Here is a whimsical and captivating collection of odd facts, strange beliefs, outlandish opinions, and other highly amusing trivia of the ancient Romans. We tend to think of the Romans as a pragmatic people with a ruthlessly efficient army, an exemplary legal system, and a precise and elegant language. A Cabinet of Roman Curiosities shows that the Romans were equally capable of bizarre superstitions, logic-defying customs, and often hilariously derisive views of their fellow Romans and non-Romans. Cute book, sometimes outright hilarious, about things that happened in Ancient Rome. In this book the writer acted more as impresario: presenting historical quotes related to the topic at hand. Mildly entertaining, but I would hesitate to recommend it to someone who hasn't already read more serious books about Ancient Rome, because of its Ripley's Believe it or Not format which tends to trivialize the subject matter by focussing on extremes and oddities. The first half had quite a few tidbits I'd never encountered, but as the book went on, it became more of a rehash of things that you'd know if you'd read recent popular books on the subject. This isn't a book where you're going to learn about the might of the Roman Empire. You're not going to learn about the political transition from the Roman Republic to Imperium Romanum. You won't learn about the Eastern / Western divide, or anything typically regarded as important to history. You should absolutely read this book though, because instead of telling you the same factual statistics, with the same recounting of the grandeur, the culture, and the importance of Rome as every other book - This isn't a book where you're going to learn about the might of the Roman Empire. You're not going to learn about the political transition from the Roman Republic to Imperium Romanum. You won't learn about the Eastern / Western divide, or anything typically regarded as important to history. You should absolutely read this book though, because instead of telling you the same factual statistics, with the same recounting of the grandeur, the culture, and the importance of Rome as every other book -- this book lets you see the hints of the real, less pretty, ordinary people and their understanding of their world. A Cabinet of Roman Curiosities isn't chronological, instead chapters are clustered according to loosely tied together topics. Each of these topics are less of a true chapter, and are instead a list of assorted facts (usually in the form of a quote) and their source, occasionally with a comment from McKeown adding context or an interesting tidbit on the same subject. As an example of what you'll find in this book, here's an entry from the chapter "Animals:"
"India produces one-horned horses and donkeys. Drinking vessels are made out of their horns. If anyone drinks fatal poison from one of these, the attempt on his life does him no harm at all, for the horn of both the horse and the donkey seems to be an antidote to the poison (Aelian On Animals 3.410. This passage foreshadows the myth of the unicorn, as does Pliny's description of the rhinoceros as a one-horned Indian animal with the head of a deer, the body of a horse, the feet of an elephant, and the tail of a wild boar (Natural History 8.76)." O livro é basicamente uma coletânea de anedotas e citações traduzidas de documentos históricos, não havendo textos introdutórios ou uma grande contextualização. Além do prefácio, o autor (que é um professor de latim, não um historiador) só aparece no texto para complementar alguma informação ou contextualizar o leitor através de algumas palavras ou linhas, dizendo o tempo de governo de algum imperador, o local e data de alguma batalha etc. A citações possibilitam uma visão mais ampla das crenças O livro é basicamente uma coletânea de anedotas e citações traduzidas de documentos históricos, não havendo textos introdutórios ou uma grande contextualização. A citações possibilitam uma visão mais ampla das crenças e superstições romanas, uma vez que essas passagens mais bizarras não são normalmente mencionadas em livros de história romana. Também é interessante poder ler a tradução mais direta desses textos, já que muitos autores discutem as fontes originais sem apresentar o texto “bruto”. Há alguns erros no texto (por exemplo: é falado que a guerra entre Roma e Alba Longa foi no início do período imperial, na verdade foi no século VII a.c., além do uso indiscriminado e despadronizado do termo “imperador”), mas nada que comprometa a leitura. O livro é dividido em 23 capítulos, separados por temas (educação, direito, medicina, religião, exército, construções, entre outros). Há dezenas de imagens ilustrando os capítulos. A collection of rather trite anecdata about ancient Rome (though many are from Greek sources, as expected), gifted by a well-meaning relative. The chief problem here is that one gets the notion that this is meant as a coffee-table book for light reading: but without any source criticism (a limitation of the format that McKeown acknowledges in the introduction...but who reads those?) it ceases to be worthwhile history in any sense. Some of these 'facts' might make for entertaining reading, but Mc A collection of rather trite anecdata about ancient Rome (though many are from Greek sources, as expected), gifted by a well-meaning relative. The chief problem here is that one gets the notion that this is meant as a coffee-table book for light reading: but without any source criticism (a limitation of the format that McKeown acknowledges in the introduction...but who reads those?) it ceases to be worthwhile history in any sense. Some of these 'facts' might make for entertaining reading, but McKeown runs the risk of a layperson taking something from, say, the Historia Augusta or Suetonius entirely at face value. This is a collection of little known Roman facts and oddities, with chapters with names such as: Women, Slaves, Decadence, Tempus Fugit, and Food & Drink. There's many more. Anyone who'd like to know more about the Romans would enjoy this book. Interesting facts for history buffs. The author's humor brings the pages to life. Unless someone is a serious Romanphile (or whatever the correct word would be), it's hard to imagine reading this book for more than a few minutes at a time. Tidbits and trivia, grouped by topic, from various historical sources, the material is interesting, but it would be like sitting down and reading The Guinness Book of World Records. It's what I call a "stop and start" book, the kind I like to have loaded on my phone so I can read a few entries while on queue or in a waiting room without get Unless someone is a serious Romanphile (or whatever the correct word would be), it's hard to imagine reading this book for more than a few minutes at a time. Tidbits and trivia, grouped by topic, from various historical sources, the material is interesting, but it would be like sitting down and reading The Guinness Book of World Records. It's what I call a "stop and start" book, the kind I like to have loaded on my phone so I can read a few entries while on queue or in a waiting room without getting too engrossed in the material. A short book of snippets from Roman documents and inscriptions, giving hints of how Romans thought and how they lived, chosen mostly for entertainment value. Material is sorted into chapters according to its topic: "Family Life," "Women," "The Army," "Religion and Superstition," and so on. Most entires are quite short. This book might be used as bathroom reading. Much of the interest in this collection is in observing how often the Romans seem just like us, and equally often, how vastly and often A short book of snippets from Roman documents and inscriptions, giving hints of how Romans thought and how they lived, chosen mostly for entertainment value. Material is sorted into chapters according to its topic: "Family Life," "Women," "The Army," "Religion and Superstition," and so on. Most entires are quite short. This book might be used as bathroom reading. Alicia Carr Mitsch tagged me and asked me whether I had read this or not. I've read bits and pieces of it. The work is fascinating! Little bits and squiggles of Roman life all thrown into this work. It's almost like a bathroom book. I think very highly of it and if you are one of those who went to DisneyWorld and drank the Kool Aid about how it's a small world after all, you should read this book. The Romans were a very different kind of people. Not too impressed with this. Most of the stuff you have either heard before or is used without giving a source. The source for the chapter on the Caesars is mostly the gossip Suetonius. Everyone even slightly interested in ancient Rome has read his book on the twelve Caesars already. I expected much more from this. I was disappointed. Bitesize chunks of history. The author imparts various facts relating to a variety of subjects, all no more than a line or two. This was a book that was easy to dip in and out of and was interesting in its own little way. Very interesting with many first accounts of ancient Roman life. There was a great deal of different information, however there needed to be more author involvement in perspective when it came to questionable perspectives on politicizes events. It's not really a "sit and read this" book, it's more of a "every once in a while pick it up and annoy your husband with the new things you learn" lol. Still, it's got pretty interesting stuff in it and it's a fun way to sort of learn for the most part. A brilliant evocation of the entire spectrum of the life and society of ancient Romans in their own words.. Many of the individual facts were interesting, but an entire book of them was mind-numbing. Without an overall narrative, there wasn't much to keep me turning the pages. This is the nerd in me's guilty pleasure. P.S. The Roman's were batsh*t crazy. I blame all those lead pipes. A well rounded work of investigation into many facets of Roman life and history as commented upon by the Romans themselves. Interesting and wide-ranging. Nifty! A cool little book containing a wide-ranging miscellany of Roman stuff! Highly recommended for casual reading! Far more interesting and consciously semi-tongue-in-cheek than this kind of book usually is. Lots to be learnt here! material overall. Still though; interesting.